The Inter-American Development Bank approved a supplemental loan of up to $65 million to complete the expansion and rehabilitation of the road network under The Bahamas' New Providence Transport Programme. Sep 5, 2012 (IDB) — The Inter-American Development Bank (IDB) approved a supplemental loan of up to US$65 million to complete the expansion and rehabilitation of the road network under The Bahamas’ New Providence Transport Program. The project seeks to reduce transportation costs for road users by providing a more rational and efficient transport system for New Providence Island, where the capital Nassau is located. The program is expected to improve road safety and public transportation and reduce environmental impacts caused by traffic congestion. Traffic accidents and road fatalities are expected to drop by 15 percent upon the program’s completion. Approximately 70 percent of the country’s population lives on the island of New Providence, and about 85 percent of the workforce in New Providence uses private automobiles to commute to work. Traffic congestion is also further affected by the daily arrival of four to six cruise ships at Nassau Harbor that discharge thousands of tourists who leave the docks to visit historical sites, shops and beaches. 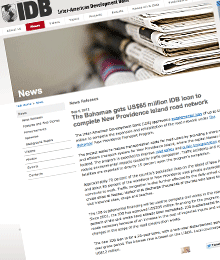 The IDB supplemental financing will be used to complete civil works in the road network. Since 2001, the IDB has approved US$205 million financing for the program; and 90 percent of the civil works have already been completed. IDB supplemental financing was made necessary because of an increase in the cost of imported inputs and unforeseen changes in the scope of the road construction works. The new IDB loan is for a 25-year term, with a two-year disbursement period and a 2.5-year grace period. The interest rate is based on the LIBOR. Local counterpart financing totals US$12 million. In an effort to stop illegal, unreported and unregulated fishing in the region, 18 countries signed a declaration of cooperation this week in Belize.